New toy alert part 2! I didn't need a new LRF rod and I certainly wouldn't normally opt for a long (8' 6"), heavy (to 10g), tubular tipped rod, but the money was right and in the spirit of my favourite saying of the moment - you don't know what you don't know - I went for something well out of my norm. Out the bag it's clear that Golden Mean rods are quality and well put together. Excellent finish with stainless Fuji SiC rings, full EVA grip and a Fuji reel seat. There's some really nice design features as well. The grip above the seat is ultra short meaning I can rest my index finger on the blank for increased sensitivity, without having to change my preferred grip. The extra length on such a light rod could have been a problem, but Golden Mean chose some extreme micro guides for the tip section, cutting down on precious milligrams and keeping the action crisp. In addition, the GM website highlights a special design for the spigot that enables similar sensitivity to a one piece rod - which wouldn't be practical on a rod of this length. 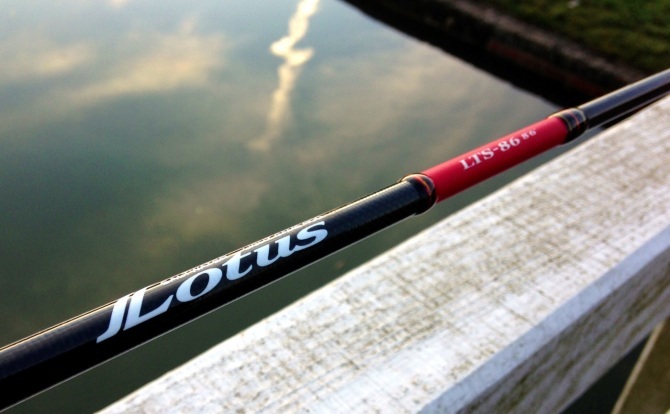 The Lotus LTS-86 is a highly specialist rod. As far as I can make out, the intended use is as a heavy (light) rock fishing rod when big fish may be targeted at distance. Not uncommon for Japanese rods, it is species specific - in this case oversize Mebaru. That doesn't really mean a lot to us over here in Europe but it kind of gives us an idea of the properties it may have; sensitive, responsive, strong backbone & fine caster. The new rod I alluded to mention on my previous pike post was the Lotus. My logic to using this rod on the canal was as follows. Recently I have noted that there are good fish sat right up against the reed beds on the bank of some sections of the canal. In most instances I have struggled to cast and retrieve parallel to these reed beds with a shorter rod. The longer rod means I can get the tip nearly a foot past the outer reeds and perform cast and retrieve duties. Really happy with that. Shame the fish weren't more obliging on Sunday. The Lotus also ticks boxes for more than accidental captures of Pike. It performed capably with the 3-4lb fish I caught and I'm confident it would handle much bigger fish without losing control. Despite its underlying strength I didn't feel disadvantaged when I scaled down lure size. It was very sensitive, which surprised me given the extra length. I definitely need to get used to the differences in wrist to tip action with a longer rod, but this is very much down to me. The rod behaved well. As an additional plus-point, I noticed that the longer length of the rod allowed me to get the rod tip nearer the water on the raised sections of bank near some bridges. This is going to be really handy when there's a strong breeze blowing as it will mean less line drag. Clearly this will prove hugely beneficial on many piers, jetties and rock marks too. And so you have it. A rod that I wouldn't necessarily have singled out, truth be told, is already finding niche little areas to excel. Just goes to show, you don't know what you don't know.